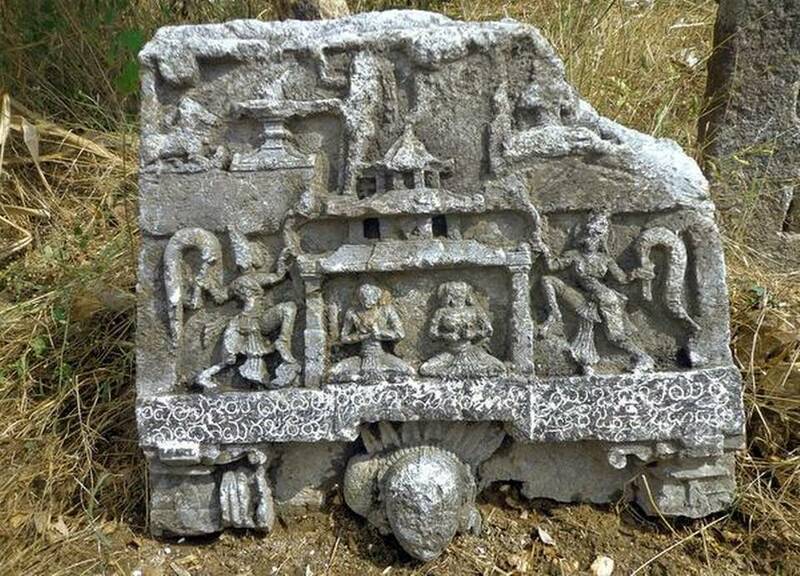 A 14th century stone inscription has been discovered at Hagalamane village in Bhadravati taluk, Karnataka state, by R. Shejeshwara, Assistant Director of the Department of Archaeology, Heritage and Museums. Mr. Shejeshwara discovered the inscription in an agricultural field on the outskirts of the village based on the information provided by local residents. It has been chiselled from a schist rock slab. The inscription, which is in archaic Kannada, speaks of the valour of Jakka, a local warrior and son of Homachara Bhaira Gowda. Mr. Shejeshwara said it is a ‘Mastigallu’, installed to commemorate Jakki, wife of Jakka, who committed self-immolation after her husband died while fighting enemies. The lower panel of the inscription has been damaged and all that remains now is the head portion of a sculpture of Jakki wearing pandanus flowers. In the middle panel, there are carvings of goddesses taking Jakka and Jakki to heaven. In the topmost panel, there are carvings of a Shivalinga and a Nandi being worshipped by a sage in heaven. Experts opined that the inscription was installed during the early phase of the Vijayanagar kingdom.